Pleasure tops is not top of the line. A stimulating massager with a very unique shape, Pleasure Tops combines a cone shaped body and a clitoral attachment to arouse your desires. Made of soft, pliable TPR material, it warms up quickly to body temperature and can also be safely used with any type of lubricant. Vibrations, concentrated in both the rounded tip and stimulator, can be simultaneously adjusted by twisting the base to the left or right. The soft clitoral attachment delivers purring sensations right where you need them most. 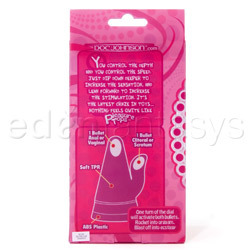 Phthalate-free, Pleasure Tops is also waterproof for worry-free fun in the shower or tub. For best results, wash between uses and enjoy with your favorite lubricant. Thank you for viewing Pleasure tops page!